It's also on the left in here. You can see the original Hale Navy on the left most edge. I love that Gale Force sort of marries the Navy with the 90s teal. 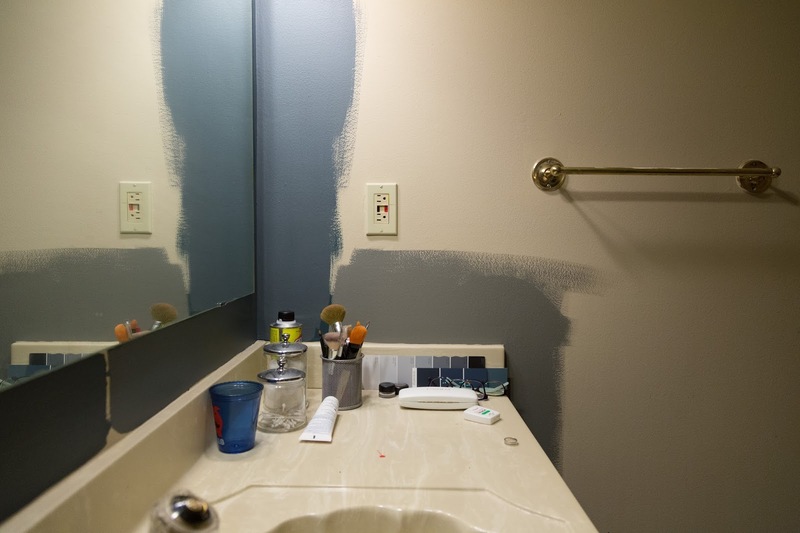 On the right is a color that I originally had high hopes for, a SW blue gray, but it looks too periwinkle in person. No good. The color under the outlet is from Ashford's old bedroom, Behr Pier. It's ok, but it just doesn't do much for me. You can't really see from this far away, but those silly enormous upper windows are a hideous greeny/yellowy beige vinyl. Better known as, THE ALMOND CURSE ON MY LIFE. Yes, the vinyl is huge and cannot be changed. 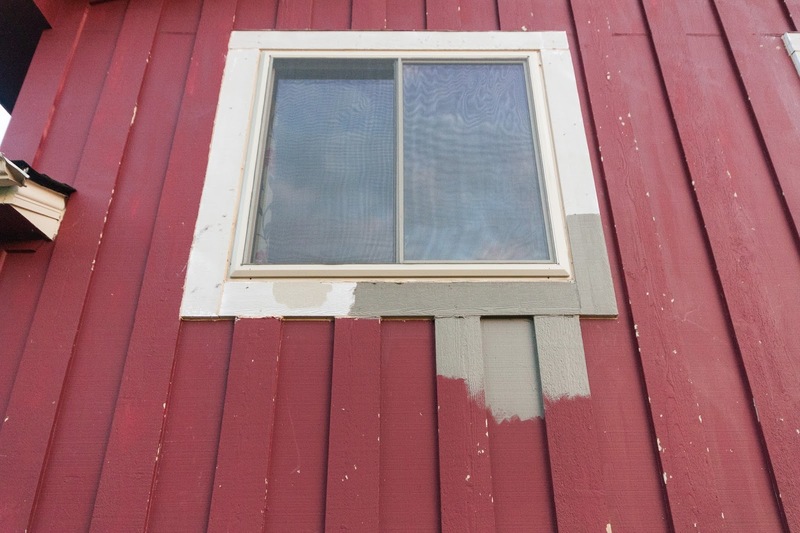 Therefore, I have to match up the trim of my house to these stupid windows. This is not my first choice, or my 5th choice, or any choice. I don't like the color, but I found a paint color I can live with that matches pretty well. Not perfectly, but close enough. You can see it on the bottom left of the ridiculously wide trim. It is Clarksville Gray by Benjamin Moore. And the darkest color on that same color card, is Gloucester Sage....which you can see on the body of the house. Yes, that wide trim will be painted the body color because it is just too big. Our house sort of looks like a Christmas Carnival with the green storm door, I hate it! 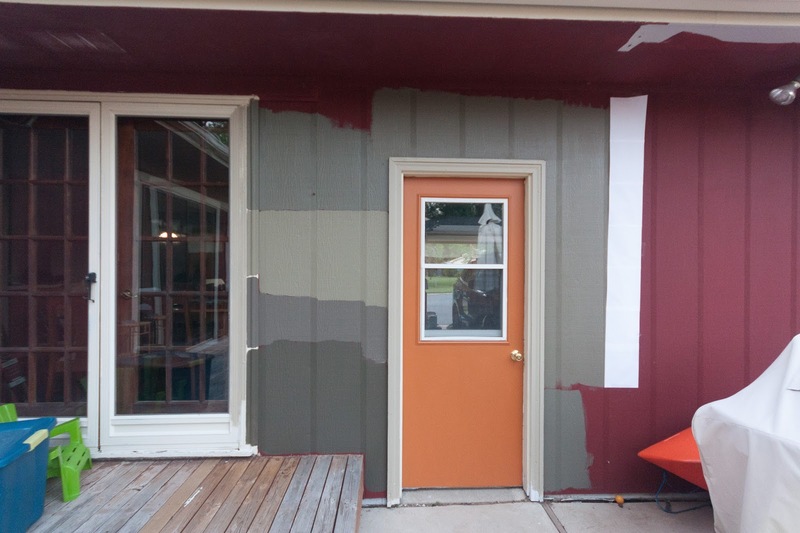 So I set up the back of the house as a testing ground for a bunch of paint samples. Here, we have on the left going down: SW Cocoon, BM Hampshire Gray, a custom color match of a gutter sample, and SW Muddled Basil. Then on the top is the color of my mom's house, on the right is BM Gloucester Sage and the bottom is Cocoon again. 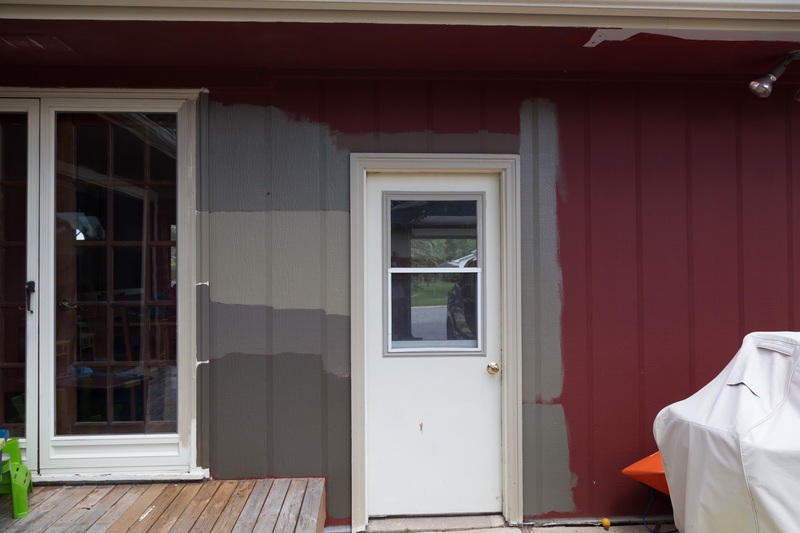 The trim around the garage door and the right side of the patio door is painted with the Clarksville Gray. I had intended on painting our front door with SW Copper Pot, and here is the garage door painted with two coats of that color. Side note - if you buy a sample container of paint from Sherwin, it is totally enough to paint a door. And it's satin finish, too! Ok, so the orange is a no. Too bright and too yellowy. And with any of these paint colors, it seems a bit too much like camo and blaze orange. But I think the Gloucester Sage is a good color (on the right) and it seems less green when I put up the white printer paper to separate it from the burgundy. I do like depth and color of the dark Muddled Basil, but I don't really want that much contrast between the trim and the body color. What say you? Any warm greenish grays I should try? 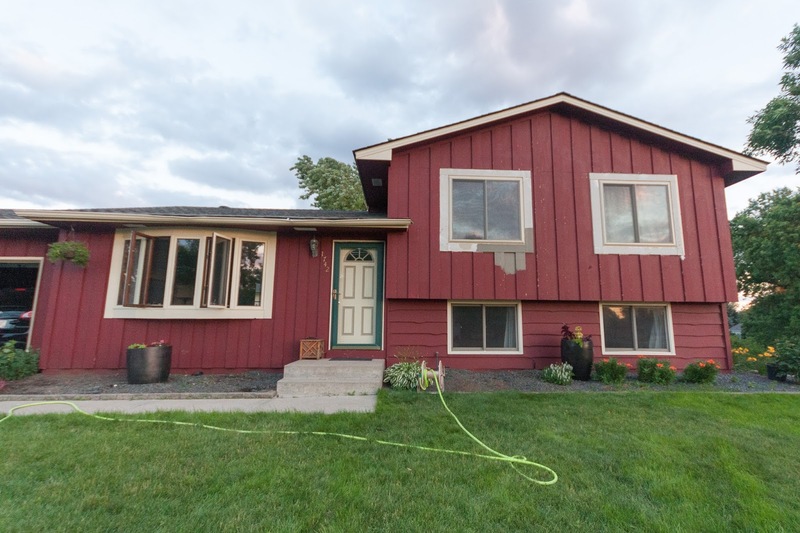 Please help me because we are getting this house painted in a couple weeks! Figuring out paint is a hard choice! I do like the bottom left paint color though, paired with a lighter trim. I agree with Pine Tree House. Go with your gut, but don't stress too much! Too many grays in this world. Pick it and just "go with it!" It will be great! Hope you are getting settled in. You are my hero. I had a hell of a time picking paint colors. I picked three different greens for the kitchen and I'm still not totally happy with it. Check out Benjamin Moore's copley Gray. Its a darker greenish gray and it really pretty on a grand scale! I am really loving where you are going with the door colour! 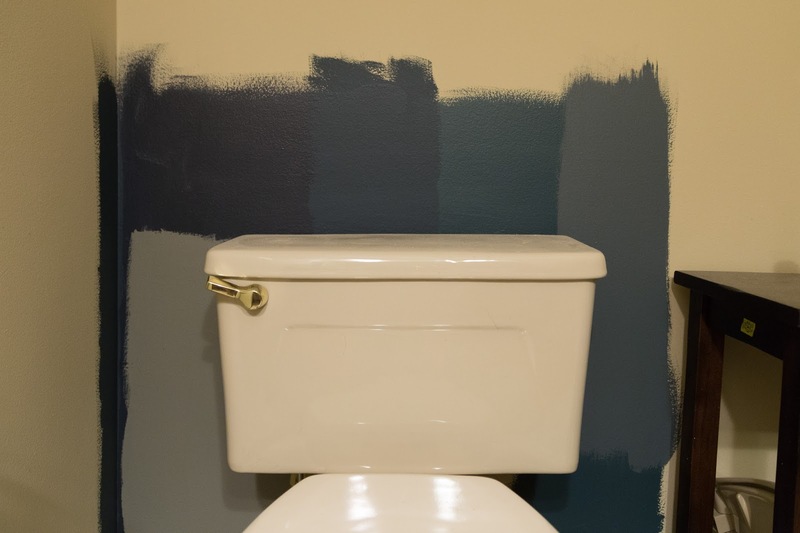 Love the color you chose for the bathroom! I think Ben Moore Hampshire Gray could be a winner for the house color. I agree about the orange with the house color options. Maybe try a goldenrod or mustard yellow? 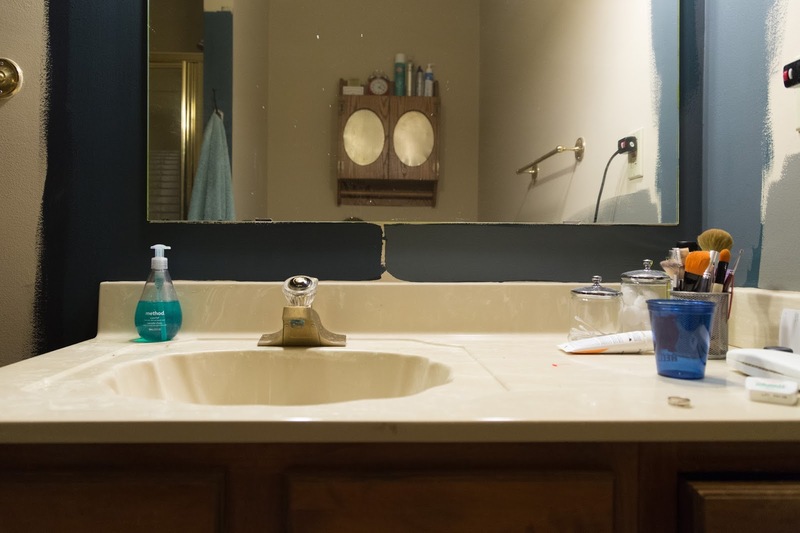 You could put beadboard half to 2/3 way up bath wall and paint it your dark color and the rest of the wall and ceiling a light color. I don't remember seeing any windows in your bath and this might keep it from looking like a dark hole. Not sure if beadboard is your style. I love reading you blog! This is random, but the comments on the old post made me sad. Micah from The Yellow Front Door and Amanda from Hip House Girl were bloggers I loved by "back in the day" (2010...before most of the big bloggers of today were blogging). I miss them! You should try Tate Olive. I just used it in our living room and love it, but it's dark enough it would work well on exterior. 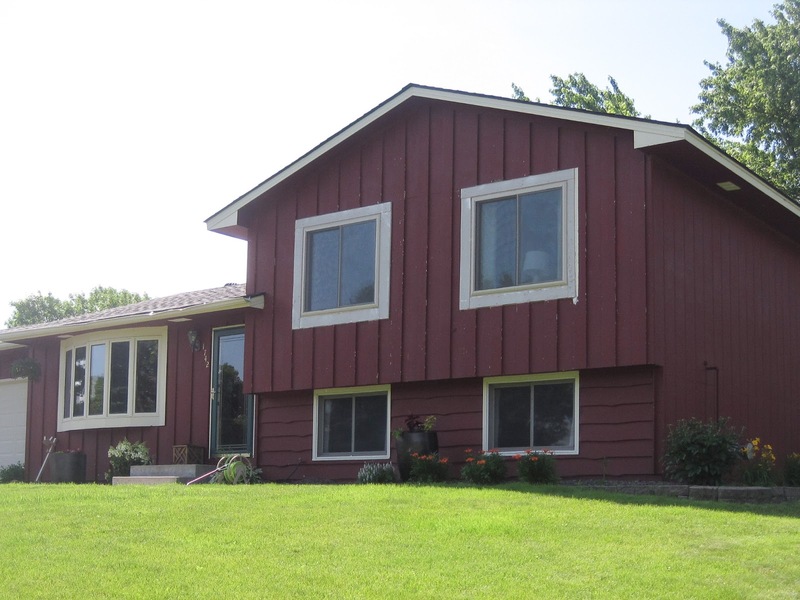 I found exterior paint color choosing to be the worst decision to make. Ever. It's just so ... permanent. It's not like you EVER want to do it again so gosh, you want it to be right. So, that's helpful of me to say? I actually like the orange, but I'm crazy.